Thursday night, September 6, 2018, at around 8:45 PM the sound of gunfire pierced the air in Baltimore, Maryland. This isn’t an unusual sound in Baltimore, nor is it unusual sound for any urban center in our country. As a matter of fact what would be unusual would be a night without gunfire. The familiar refrain of a body just dropped in Baltimore is a sad true fact. We all know that at least one black body drops every day in my hometown. This is no longer the city that I grew up in. It is a far different place. It is a murderous place where human life seems to have no value and the loss of life by gunfire is something residents are now comfortable with. On this particular Thursday night, another black person was murdered. This lady was callously murdered in cold blood coming from entertaining with her friends. There will be no huge march prepared by an angry Baltimore black community for the violent end to the life of this young lady. Oh, many tears will be shed at her funeral services because she was a beloved lady. She was a striver, a goal achiever, a sharer, and a teacher. Yet no of that mattered to the individual with the finger on the trigger Thursday night. On that night this vivacious woman was a target scoped and ready to be eliminated. The media has already ascertained that this murder of a 25-year-old black woman was not gang-related. I wondered even why that presumption was even necessary was that fact essential to defining this senseless act of violence? On Friday, September 7, 2018, we find out that this beautiful young lady was a witness to a double homicide murder in April of this year. This sister was in the wrong place at the wrong time twice in the final 5 months of her life. The final time ended up being the final moments of her promising life. So at least four black lives are linked together in this tragic event that culminated in this young lady’s murder on that street in Baltimore County, Maryland. The three murdered black individuals and at least one or more black individuals who had the hands on the triggers of murder weapons. 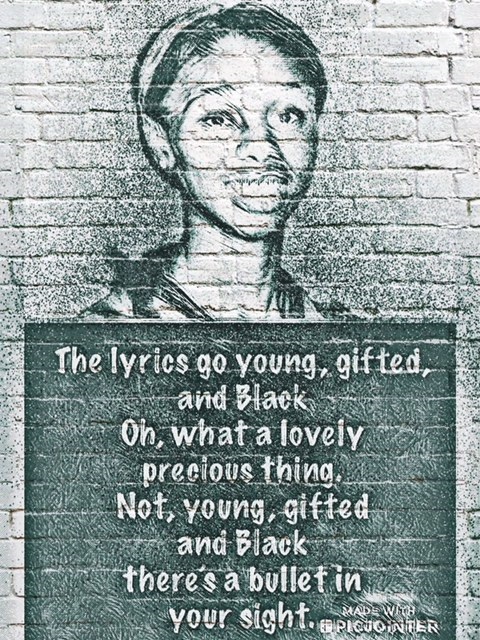 The lyrics go young, gifted, and black, oh what a lovely precious thing; those lyrics aren’t young, gifted and black there’s a bullet that awaits you. We will hear over the next few weeks about this young lady’s soul finding a peaceful resting place. My question is how that is possible when a searing hot bullet tore out the soulfulness of her beautiful spirit? You see the victim of this heinous crime was a graduate of my alma mater, Morgan State University. That fact was even mentioned in the initial accounts surrounding her murder. All I could read was the crime wasn’t gang-related and that this young black woman took multiple gunshots to be silenced forever. It didn’t mention that she was a leader in life chosen by her peers to captain them into battle on the basketball courts. It didn’t mention that she had been raised in Baltimore. It didn’t mention that she was a graduate of the only university in Maryland that had been designated national historical site. It didn’t mention that she had a fantastic smile and a firm belief not only in herself but also in all the youth she interacted with. The only thing I read was not gang-related, multiple shots and witness to a heinous act. You see at that moment this young, wonderful, competitive black woman was simply another one of them. You know, them, those included in the deadly urban body count. I have purposely haven't named on this wonderful black woman until this moment, Tracey Elizabeth Carrington. You see by next week after Tracey is put in the ground except for her loved ones. Most people will have moved on other things rather than remembering the life of Tracey Elizabeth Carrington. Tracey will simply be one of the multitudes of black people who lives were snatched from them at the beginning of the climb. Tracey hardly had a chance to enjoy the fruits of what the tree of life offers. Although there was a 40-year difference in age between this black woman and myself. I felt a connection to her because we met on numerous occasions during the time Tracey was matriculating on the campus of Morgan State University. You see I would always catch the end of the women's basketball games at Hill Field House when I attended the men's basketball games. I even met Tracey during the homecoming tailgate events my fraternity held a couple of times. She and I weren't personal friends so to speak. However, we both traveled in the circle of black men and women who were both attendees and graduates of Morgan State University. In addition, to that fact, both Tracey and I resided in the eastern portion of the Baltimore metropolitan area while growing up. I admit she grew up in a different era as well as a totally different environment. My time was just a little more caring for our community's jewels. This black woman was indeed a black precious jewel whose life was snuffed out in this ongoing vicious cycle that has engulfed our community. We even attended the college football game this past Saturday at Morgan. Ms. Carrington was shot multiple times last night on Belair Road. Tracey was murdered in cold blood. Her killer most likely was someone who knew her personally. But certainly, it wasn't someone who loved Tracey Carrington. I wanted to dedicate this complete essay to the memory of Tracey Elizabeth Carrington. You should not be remembered as a victim. You shouldn’t be placed in any sense in the category of anything gang-related. Nor should you be connected in any way with the thugs that are involved in this senseless act of violence. Of course, you will be because the world that surrounded you was not totally respectful of the gifts you owned in our black communities future. Your life Tracey was full of good soulful vibrations. You glided into the world with unbelievable expectations. It is truly a shame that a hate-filled individual hated his life so much that he decided to take yours instead of his/her’s. Rest in heaven, my sister.